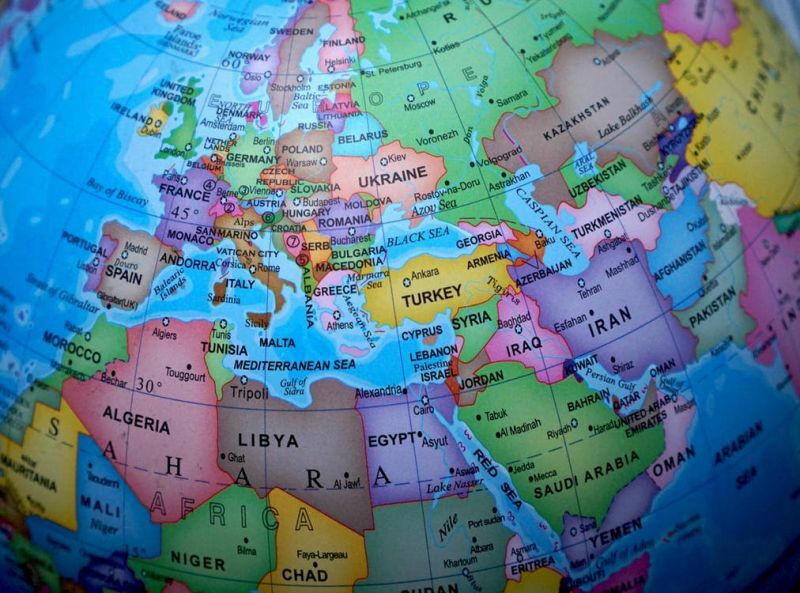 So, California Girl has been in Europe forever…(she says she’s working, but whatever). My 10-year-old granddaughter and my 6-year-old grandson were visiting this weekend and we were talking about it a little. I explained that California Girl was visiting Scotland, Spain, Italy, France, Czech Republic and London, and they asked where all those places were. When we got to London, I told them it was where Mary Poppins was from and suddenly my granddaughter starts talking with an English accent. She was asking if we could “have a spot of tea” and laughingly asked for Beef Wellington for dinner. This went on for several minutes, back and forth between the two of us, using our best accents. 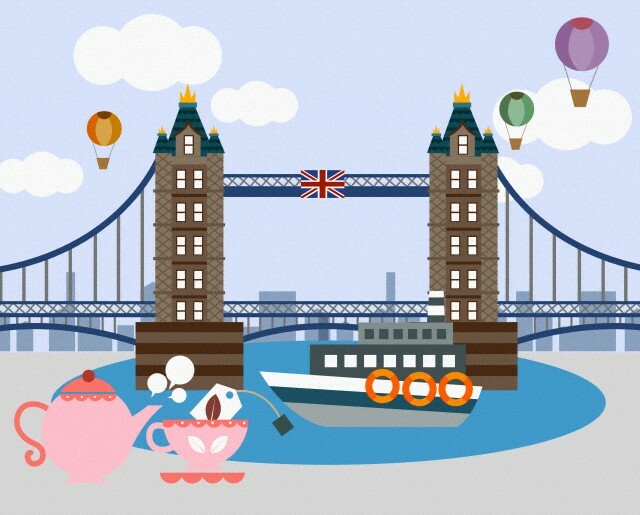 I think my grandson was feeling left out because, with an accent that would make Sean Connery sound like a sideshow hack, he said: “I have heard that London Bridge is falling down….” We all about died with laughter. Maybe you had to be there. California Girl comments: First of all, I AM working very hard drinking wine, seeing sights and eating amazing food. I mean how could you say I am not suffering here? Besides, my life is a lesson to your grandchildren in geography right? See I am a giver, always looking out for you Ms. April! Before we start, you already know that sometimes I tout a particular product that I just love. 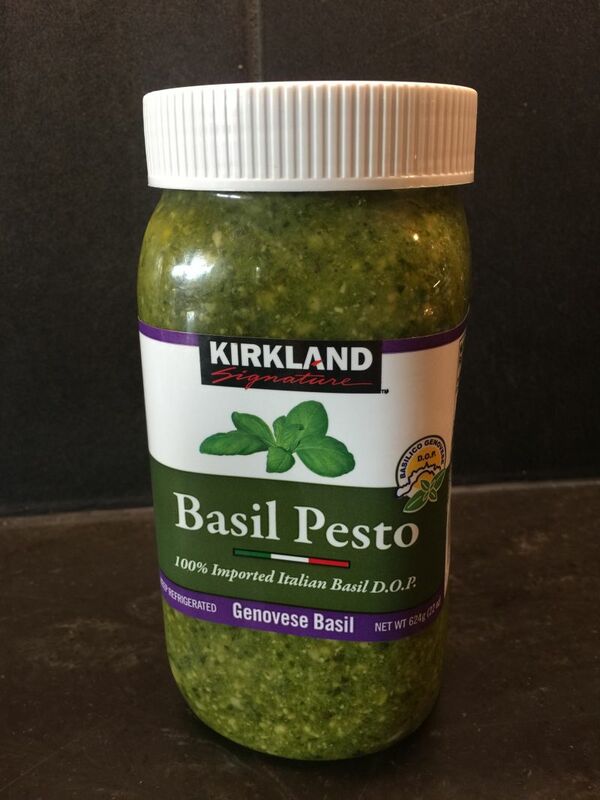 One product I am NEVER without in my kitchen is Basil Pesto, and the best I have ever tasted is from Costco. In fact, I used to make it myself every summer with basil from my garden and just freeze it in portions for use the year round. Not anymore. This is my go-to for Pesto! It is fabulous and is the Pesto I used in this recipe. California Girl comments: I agree, that Pesto is absolutely delicious. It is also not too oily so it holds up well in recipes. 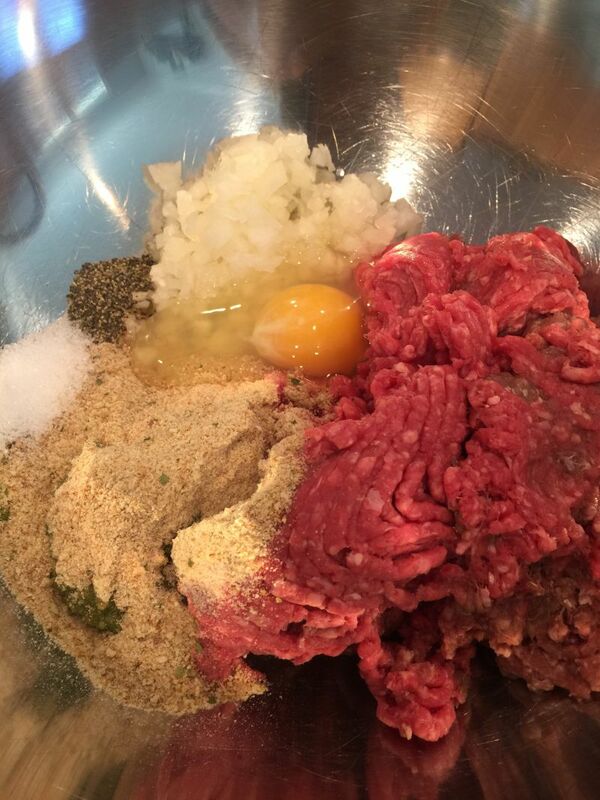 In a large bowl, combine the beef, pesto, garlic, onion, oregano, parsley, ONE egg, bread crumbs, salt, and pepper. Use your hands and gently fold together until uniformly mixed. 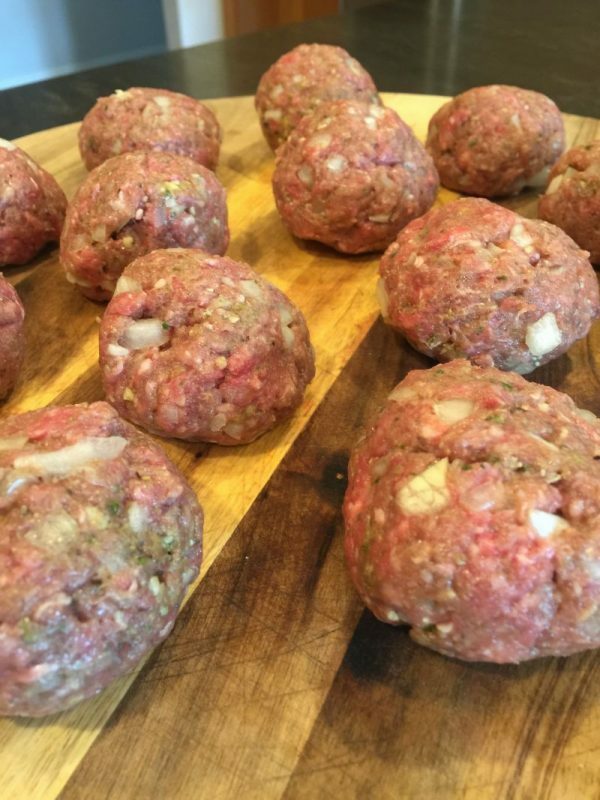 Form into 12 meatballs and place on a cookie sheet lined with foil. Bake in a 400 degree oven for 20 minutes. Remove from the oven and allow to cool enough to handle with your fingers. 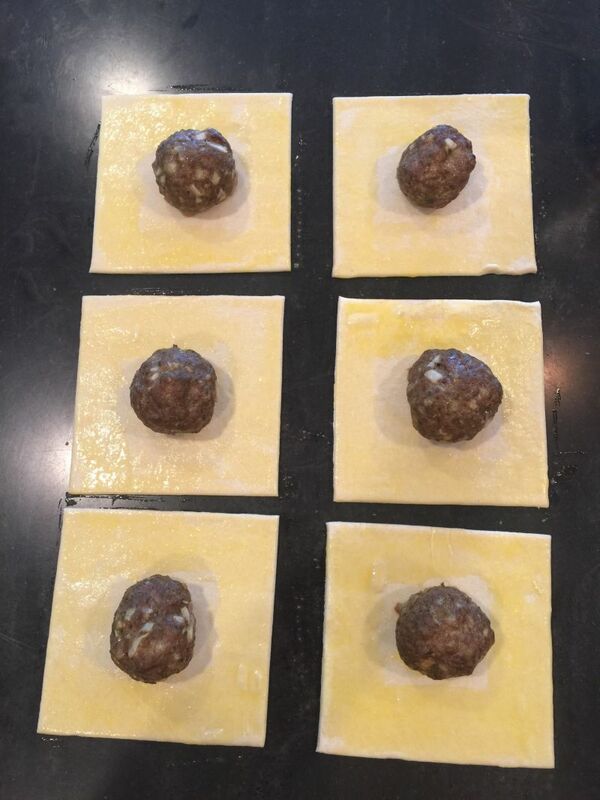 While the meatballs are cooling a little, prepare the puff pastry. Whip one egg with a whisk in a small bowl with 1 tsp of water. 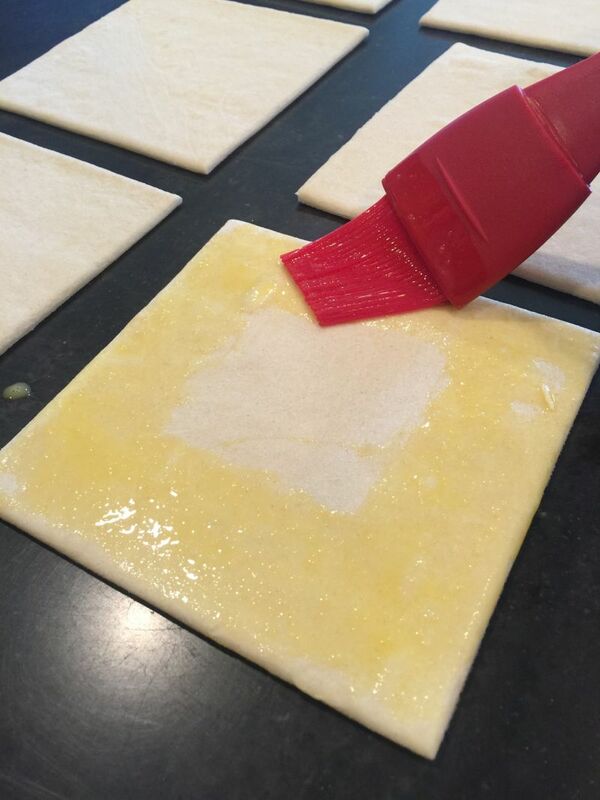 Lay the pastry out on the counter and brush all four sides of each of the pastry squares edges with the egg mixture. 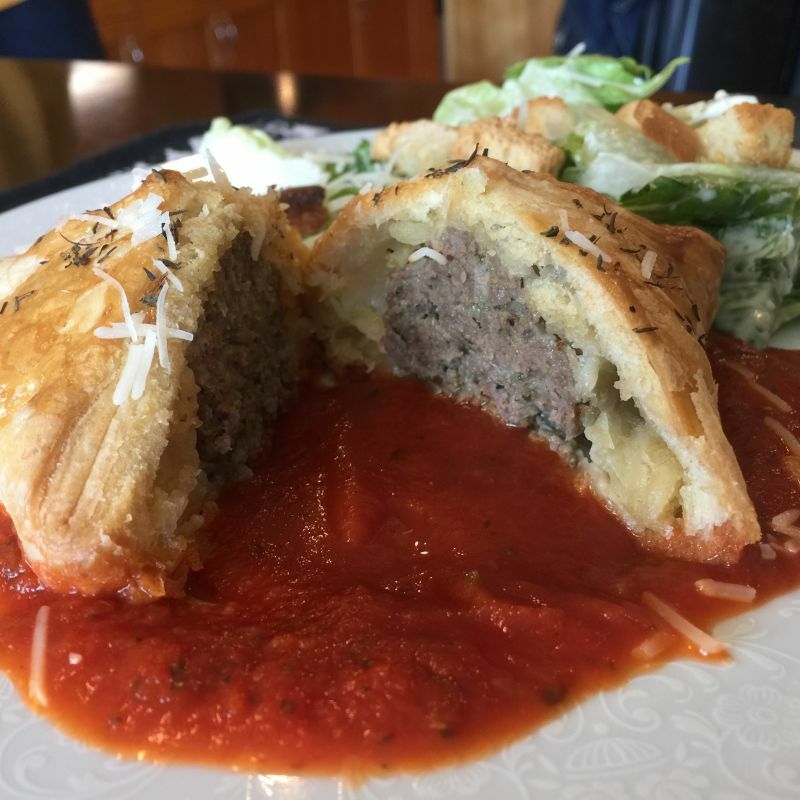 Place one meatball in the middle of each puff pastry. 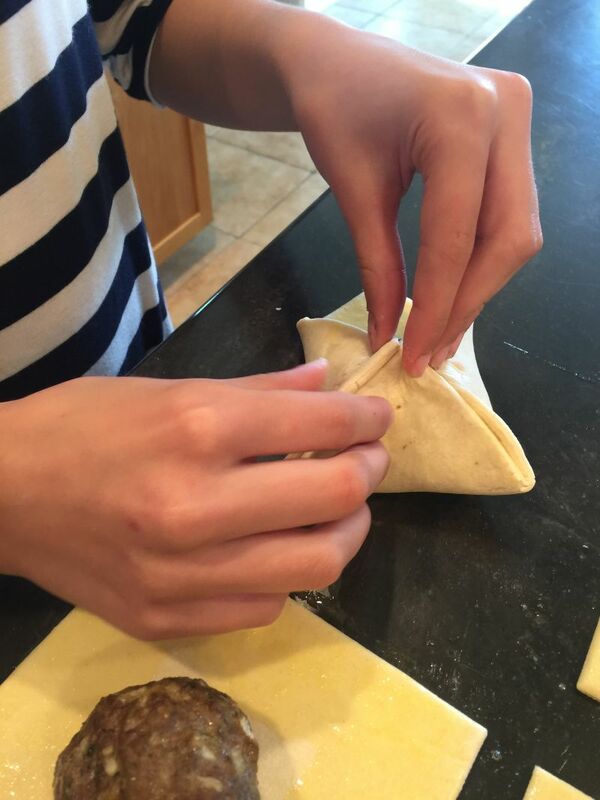 Bring up each corner of the puff pastry to meat in the middle on top of the meatball and press the edges together from the point to the edge of the square of pastry, as shown. Place each borsetta on a cookie sheet or baking pan that has been sprayed with a nonstick spray, and brush each with the remaining egg mixture. 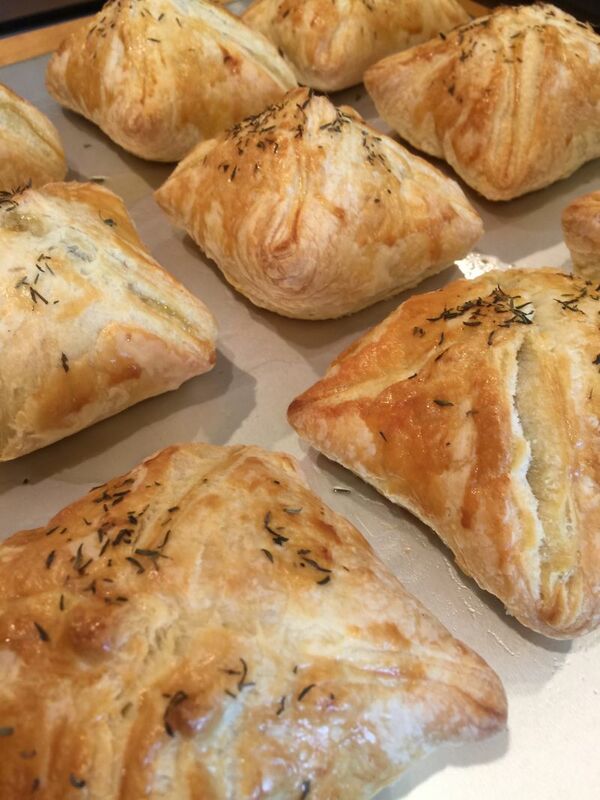 Sprinkle with a little dried-thyme, and bake in a 400-degree oven for 20 minutes. While the borsetta are baking, take the jar of spaghetti sauce (I use traditional Prego because it isn’t chunky!) and heat it on the stove in a small pan with 1/2 cup of wine. I know California Girl is going to pair a lovely wine with this dish, so just use a 1/2 cup of that. As you cut these little meat purses into bites, dip them in the sauce before you eat them. The crust is delicate and dipped in the wine infused sauce it becomes a veritable party in your mouth. Serve with a Caesar salad and you have a dinner worthy of a 5-star restaurant! California Girl comments: For this week’s pairing with the Borsetta, we are going to go with a Trader Joe’s exclusive. I am going for the Nero D’Avola which is value priced at $4.99 a bottle. This is a classic Italian red that is easy to drink and pairs well with Italian foods. 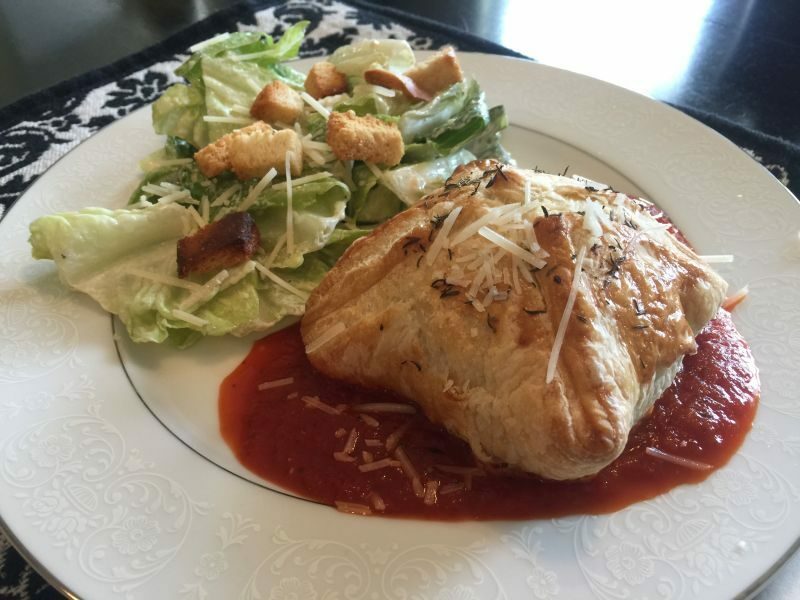 It is a lighter wine so it won’t overwhelm the light pastry and wonderful pesto flavors. If you don’t have a TJ’s near you, try a chianti. Make sure you open the bottle and decant it into your glass or decanter and let it breathe at least 30 minutes before you drink it (If you can wait that long). Ok, remember I’m a guy with limited time or experience with exotic folderol like “pastry squares.” Are these easily purchased in a grocery store or do I have to get out the rolling pin and squish The Pop n’ Fresh Doughboy? Otherwise I’m gonna try my hand at this recipe! Thanks Ms April and CG!